�����Predicting the near or long-term direction of other investment markets can be a huge risk in this economy, to say the least. However, the rare coin market has achieved such respect as of late that many financial analysts consider it to be one of, if not the most secure areas of investing disposable income today. Of course, you still have to know and understand the coin market in order to maximize your profits. 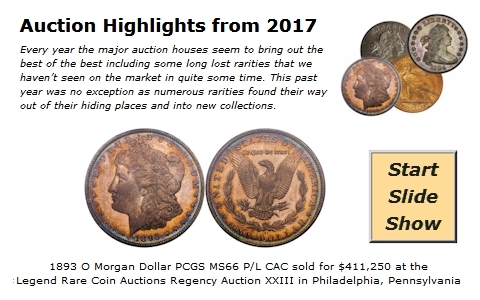 �����For the last three decades dealers and collectors have spent countless hours analyzing the rare coin market searching for rarities destined to increase in value. Certainly, supply and demand is always the main factor in selecting the right coins for future profits. But advanced numismatists will also look for potential acquisitions that have other factors that make the investment less risky: coins that have a history, low populations, eye appeal, and high demand in respect to its price history in all grades and similar coins. �����The 1808 $2 � Capped Bust Gold has an original mintage of just 2,710 coins. The total population of certified coins is 70 in the circulated grades and only 27 Mint State coins by NGC and PCGS. This leaves a very small pool of available coins in the market. This has traditionally been a very popular coin to collect and, even in F12 condition (only 2 certified), the FMV is a robust $29,310. The grade with the most coins certified is the AU58 with 27 coins by both services. The FMV for the AU58 is currently $125,000. As with all certified coins there is a strong possibility that the totals may be skewed due to resubmissions. The following graph shows the path of the 1808 $2 � Gold in MS61 from July 2005 when the FMV was $81,250 through today with the FMV at $159,380. �����There are eleven certified 1808 $2 � Capped Bust Gold coins in MS61 with another eleven grading higher. MS65 is the highest grade and we have no record of a trade at that level. In MS64 the FMV is $520,000 and there is only one coin certified by NGC. As you can imagine this is a very difficult coin to acquire with such low availability and high value. But every advanced collector is cognizant of this coin and if any come available, they are ready and willing to jump at the opportunity, as long as they can afford it. This is an extreme example of what many collectors look for in pursuing rare coins with potential for higher profits. There are hundreds of other coins that have the potential to increase over the next couple of decades. Low populations that remain unchanged for many years can be an indicator for price stability, increasing confidence and demand, and possibly leading to higher prices. �����Another factor to consider when searching out potential rarities for future profits is the value on the low end of the grading scale and how it compares as the grades increase. Coins that have a high value in low grades will have a good chance of maintaining their price structure through all grades. 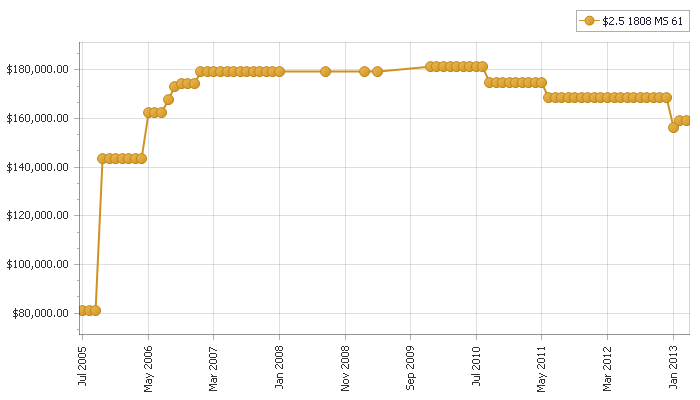 For example, the 1870 CC $10 Gold has steadily increased in value in all grades over the last ten years. This coin has an original mintage of 5,908 and there are only 79 coins certified by NGC and PCGS combined. Further, the highest grade known to this point is AU55. In F12 the FMV is $17,810 and it jumps to $70,850 in AU50. There are a total of 20 coins in all the AU grades so the number of coins available to appear on the market is minuscule. In the last ten years Heritage Galleries has only auctioned 14 of these coins and some of those are repeat sales. The lowest grade auctioned was a VG10 and the highest was AU50. The current FMV for the highest grade available is $122,850 in AU55. 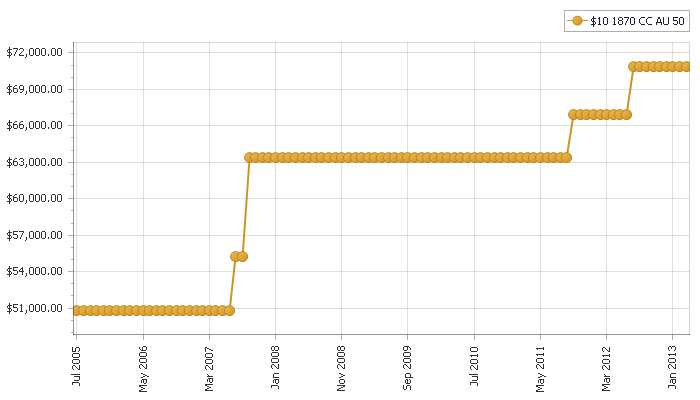 The following graph traces the AU50 FMV from July 2005 to today at $70,850.